A black woman and a lesbian, Octavia Butler stood out in a field dominated by white men, but her talent as an author made her famous. Almost from the beginning, Butler stood out. Born in Pasadena, California, she would stand 6 feet tall by age 15. Her father died while she was an infant, and she was raised by her grandmother and her mother, who worked as a maid. She grew up a shy, introverted child. Despite struggling with dyslexia, Butler began writing stories at the age of ten. Raised an only child in a strict Baptist household, she was drawn to science fiction magazines and started reading all the sci fi classics she could find. Butler participated in The Open Door Workshop of the Screen Writers Guild of America West, which was designed to mentor African American and Latino writers. She met the noted science fiction author Harlan Ellison through Open Door in 1969. She also participated in the Clarion Science Fiction Writers Workshop, where she met black gay science fiction author Samuel Delaney. Contrary to the genre’s tendency toward fantasy and escapism, Butler used science fiction as a way to explore issues facing humanity. In essays like “A World Without Racism,” she explained her view of humanity as having an innate tendency towards hierarchical thinking which, left unchecked, leads to intolerance and violence. In her fiction, she explored the historical exploitation of minorities and the creation of alternative communities. Butler published her first novel, Patternmaster, in 1976. It was the first published in a series of books about a group of people with telepathic powers; it later became the fourth book in the series chronologically. Other titles in the series included Mind of My Mind in 1977 and Clay’s Ark in 1984. She published her best-selling standalone novel Kindred in 1979. Butler published her Xenogenesis trilogy in the late 1980s. The series explored issues of genetics and race, in a world where humans reproduce with aliens known as the Oankali, to ensure their mutual survival. In the early 1990s, she wrote the Parable series, which included Parable of the Sower in 1993, and Parable of the Talents in 1999. By the mid-1980s, Butler began to receive recognition for her work. She won the Hugo Award for Best Short Story for “Speech Sounds” in 1984. In 1985, she won the Hugo and Locus Awards for Best Novelette, Bloodchild. In 1995, she received a “genius” grant from the MacArthur Foundation, which she used to purchase a house for her mother and herself. In 1999, Butler abandoned California for Seattle, Washington, where she struggled with writer’s block and ill health. In 2005, she produced her last novel, Fledgling. Friends of Butler have written that she was, indeed, a lesbian. She was also an incredibly gifted writer whose work inspired many. 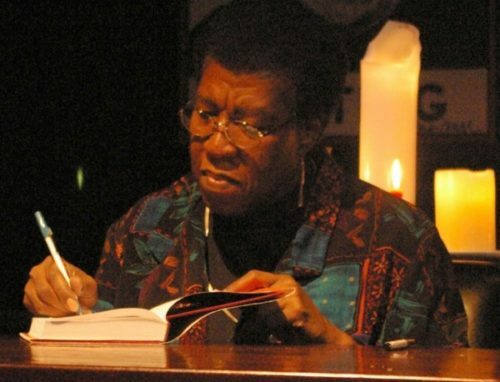 The Carl Brandon Society established The Octavia E. Butler Memorial Scholarship in her memory in 2006. Its purpose is to enable writers of color to attend one of the Clarion workshops where Butler got her start. The Society awarded the first scholarships in 2007. In April 2014, two new Butler short stories were discovered among her papers at the Huntington Library in San Marino, California. Her work is still being published and adapted today.